Non-ideal compressible fluid dynamics effects are predicted to occur in flows of fluids characterized by moderate to high molecular complexity, such as heavy hydrocarbons, siloxanes, or perfluorocarbons, by state-of-the-art equation of states. These fluids are of utmost importance in many applications, and non-ideal effects must be taken into account to improve the efficiency of industrial plants (P. Colonna, J. Propuls Power 24:282–294, 2008). 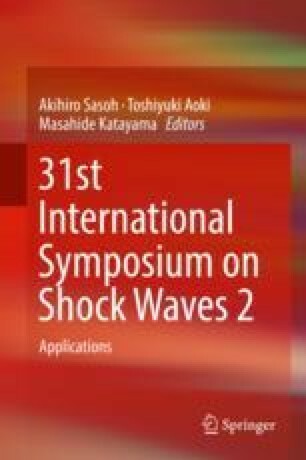 This paper is focused on two relevant non-ideal phenomena expected to occur across oblique shock waves for pre-shock states in the close proximity of the liquid-vapor saturation curve. The first one is the possible Mach number increase across the shock wave. This effect is due to the sound speed decrease, for increasing shock strength, along the compressive branch of the shock adiabat. This behavior contrasts with its ideal gas counterpart, for which the post-shock Mach number monotonically decreases with increasing shock strength. For the speed of sound to decrease in a compressive process, the so-called fundamental derivative of gas dynamics Г must be lower than one (P.A. Thompson, Phys. Fluids 14:1843–1849, 1971). The second non-ideal effect is the dependency of the maximum flow deflection angle across an oblique shock on the pre-shock state. Indeed, in the ideal regime, the maximum turning angle depends on the pre-shock Mach number only. To highlight fundamental features, numerical results are presented for a set of exemplary fluid flows. The present findings are expected to be relevant for the design of devices involving supersonic or transonic flow of molecular complex fluids.